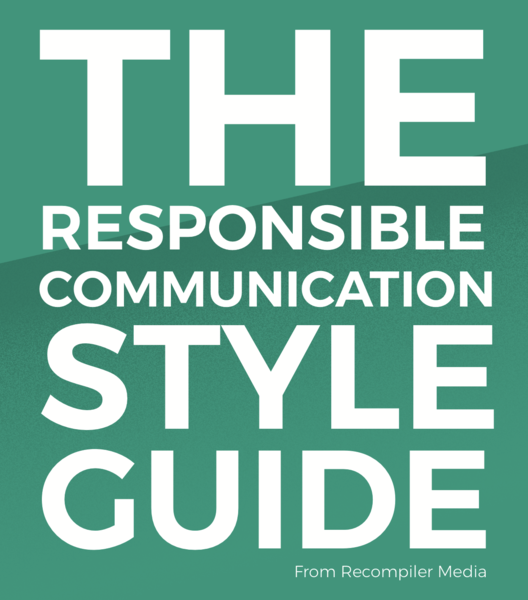 We funded this project with a successful Kickstarter in 2016 and will have copies of The Responsible Communication Style Guide available to ship in mid-2017. Thank you to all of our backers. Recompiler Media is a Portland, Oregon-based publisher focused on technology through an intersectional feminist lens. The Recompiler is our flagship project: started in 2015, we publish quarterly issues of this feminist hacker magazine. Thursday Bram writes about intersectional feminism, cryptocurrencies, kitchen sinks, and anything else that catches her interest. She organizes conferences, sticker swaps, and potluck dinners on a regular basis. You can find Thursday online at ThursdayBram.com. Audrey Eschright is a writer, community organizer, and software developer based in Portland, OR. She is the editor and publisher of The Recompiler. Previously, Audrey founded Calagator, an open source community calendaring service, and co-founded Open Source Bridge, an annual conference for open source citizens. Stephanie Morillo worked as a writer and editor for over seven years and currently works as a copywriter at a cloud computing company. Stephanie has spoken at numerous tech conferences and is cofounder of the #WOCinTech Chat Initiative (the creator of #WOCinTech Stock Images). She is Dominican-American and is from the Bronx. Ellen is based in Pittsburgh. They are the editor-in-chief and a writer at Intari, a publication covering interactions and identity. Ellen is also a software developer at Ruby Together. Heidi Waterhouse has impressive writing credentials from her career as a technical writer, and she also has a wealth of experience writing and speaking about sexuality. Heidi trained as a peer counselor with Planned Parenthood and works as an Our Whole Lives instructor for both high-schoolers and young adults. Heidi is qualified to train other OWL instructors at the regional and national level. She’s spoken on sexuality and gender panels at conferences, as well as coached others in flirting, non-intimidating come-ons, and sexuality negotiation. Melissa Chavez has experience with the use of dialectical behavior therapy techniques to change negative behavior patterns. Her career as a writer and editor started at daily and weekly news publications and moved to digital platforms (including so very many wikis). She’s worked with nonprofits on both content and usability. Rabbi Anat Moskowitz serves as senior Rabbi for Congregation Bnai Torah, a Reform Jewish congregation in Colorado and has worked in the addictions and recovery community as well as in the GLBTQ community. She has served as a college chaplain at Colorado College and the Air Force Academy, and is currently a member of several interfaith action organizations such as Together Colorado/PICO. Rabbi Moskowitz was ordained in 1999 from the Zeigler School of Rabbinic Studies. She has two Masters degrees, a teaching credential and BA in Psychology. Meryl K. Evans, the Digital Marketing Maven, is a digital and content marketing mad scientist always cooking up the perfect formula for clients’ digital marketing programs. A native Texan, she lives a heartbeat north of Dallas in Plano, Texas. Stop by her e-home anytime at www.meryl.net or tweet @merylkevans. Lyzi Diamond is an educator, community organizer, and developer working primarily with geospatial technology. She is an API engineer at Mapbox. Lyzi is also a co-founder of Maptime, an international, open source educational community for small-group learning about open source spatial analysis, web mapping, and general geographic goodness. Formerly, Lyzi was a 2014 Fellow at Code for America. She holds a dual-degree in Geography and Planning, Public Policy, and Management from the University of Oregon. Connect with Lyzi on Twitter . Dash Buck is an educator and web developer. Their favorite thing to do is to learn something new and then explain it to someone else. Dash is genderqueer and uses they/them pronouns. Learn more at dashbuck.com/pronouns. You can find Dash online at DashBuck.com or on Twitter @EmDashBuck. Michelle Ferrell is a UX designer and illustrator. Currently, Michelle is the Head of Design at Croozen, a long distance road trip application startup. She’s co-organizer for Hacksters.io Houston chapter and Healthcare-Mental Health Committee Co-facilitator for Pantsuit Republic East End – East Harris County, and a member of ABI.Houston. In her spare time, Michelle learns about front-end web development, exercises, brews coffee, and hangs out with her twin cats, Lupe and Fiasco. See Michelle’s illustrations in her portfolio and her adventures on Instagram. Connect with Michelle on Twitter. Mel Rainsberger is a person, animator, video director, content designer, UX designer, regular old graphic designer, and fearsome wielder of all the deadly digital arts. Passionate about online media and storytelling, she graduated from the Rhode Island School of Design with a degree in animation in 2004. Before her current job as UX designer for a pharmaceutical advertising firm, she ran her own company, They’re Using Tools — a boutique video company whose clients include Amazon, Emily’s List, Hasbro, Live Nation, RISD, Microsoft, and United Health. She loves taking on new and exciting projects, but is not interested in talking about how terrible it is to be a woman-type person. Most days she hangs out with her cats and friends (honestly, mostly her cats) in Providence, RI.